This upscale unit is close to everything and has an ambiance that makes it in a class by itself. 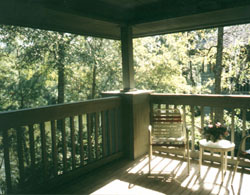 The porch over the lagoon is unique and relaxing. Few 2 bedroom units have bedrooms large enough to have 2 queen beds each as this one does. 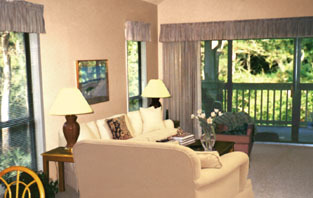 A multitude of windows gives the rooms an open feeling. 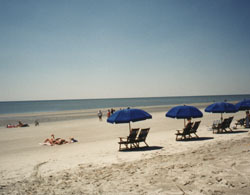 It's the nicest we have seen on Hilton Head. And the location is great! You can walk to Disney Beach, Fazio golf course, Palmetto club tennis, the Hyatt Hotel, a private pool, and the outstanding Alexander's restaurant. 2 large bedrooms with 2 queen size beds in each (sleeps 6-10). Phone, Air conditioning, TV (w/cable or satellite), Pool, Washer, Dryer, Porch overlooking lagoon, Cathedral ceiling, Bay window. Biking, Fishing, Hiking, Golf, Tennis, Shopping, Swimming, Boating, Beach activities, Wildlife viewing (such as watching herons land on the lagoon and porpoises swimming).